People enjoy an afternoon at Eminonu Square in Istanbul in January. 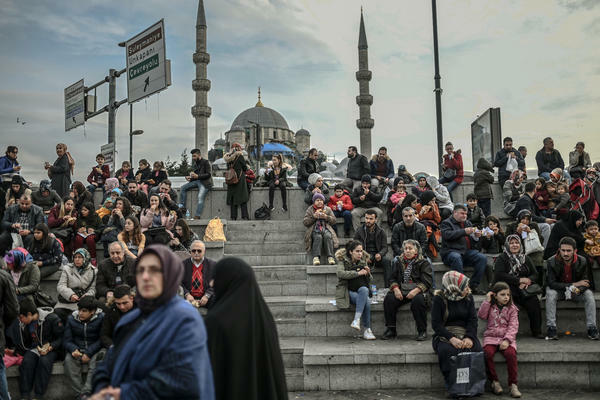 A recent survey of personal beliefs and lifestyles in majority-Muslim Turkey has found a smaller portion of people describing themselves as religious. The survey, by the pollster Konda, is a follow-up to a similar poll in 2008, and the company broke down the results from each side by side to illustrate the comparison. While some see changes a decade later as a natural progression, Turkish analysts say the shift could be a backlash, especially among the young, against a religious president and his push to form what he calls a "pious generation." The percentage-point change for many of the questions is not dramatic: Respondents identifying as "pious" slid from 13 percent in 2008 to 10 percent in 2018, and those choosing "religious" dipped from 55 to 51 percent. Figures for "nonbeliever" and "atheist," which barely registered in 2008, are now at 2 and 3 percent, respectively. There was, however, a significant drop in respondents calling themselves "religious conservative," from 32 to 25 percent. And those who say they fast during the Muslim holy month of Ramadan declined from 77 to 65 percent. Other social customs could also be changing. According to the poll, the portion of respondents saying a man and a woman should have a religious marriage to live together was still in the large majority, but it fell 5 percentage points to 74 percent. So why does the percentage of self-described faithful seem to be declining at all, even when voters keep re-electing political leaders who infuse their devout Muslim beliefs into their policies? Analysts say President Recep Tayyip Erdogan and his Justice and Development Party started out with a strong focus on the economy, which was a major draw for the electorate. Over time, his administration's use of the state to promote religion became more strident. In an official video in 2017, Erdogan celebrated the booming growth of state-funded Imam Hatip religious schools like the one he attended as a boy. At the time of the video, the schools were teaching some 1.3 million students across Turkey. "From here, the mayors were raised," Erdogan said, adding that "the members of parliament were raised, the ministers and the prime ministers were raised and even the presidents were raised" with a religious education. 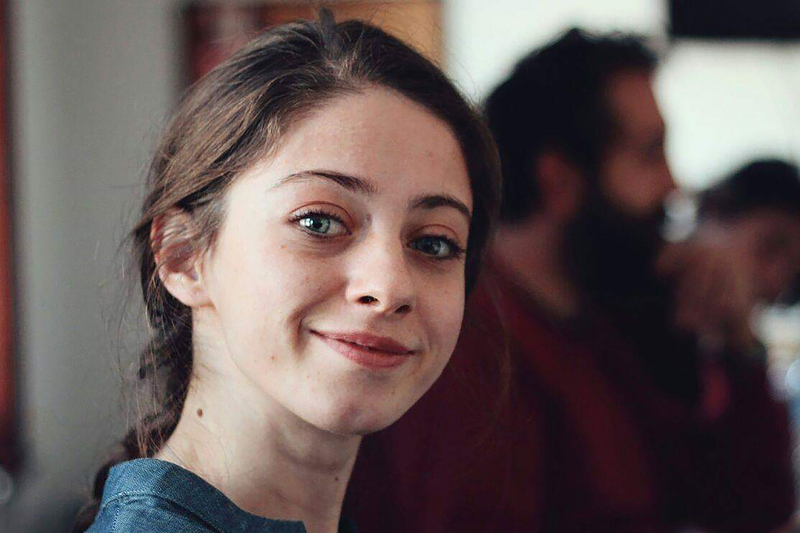 Busra Cebeci, a 25-year-old journalist, is from a Turkish generation that has had only one government leader for most of its members' lives. Busra Cebeci, a 25-year-old journalist, is from a Turkish generation that has had only one leader for most of its members' lives. Erdogan came to power, first as prime minister, in 2003. Speaking to NPR at an Istanbul cafe, Cebeci explained that she was raised to believe a headscarf is proper attire for a Turkish woman and that when she was a teenager, she put it on without protest. But she began to have questions. She recalls practicing for a school performance one hot May afternoon several years ago and worrying about getting overheated. "I remember it was really hot," she says. "So I said to my mom, 'Maybe I should take this scarf off,' and she started yelling at me. I didn't take if off." When she went away to college in Konya, a conservative Turkish city with a large student population, she remembers long talks with her friends about taking off their scarves. Then one day, she made a decision. "I would look in the mirror, and I wasn't seeing myself," she says. "One day I went inside, I took off the scarf and walked out without it. And that was my first day." She says it took two years for her father to speak to her again, but eventually her parents got used to it. The recent lifestyle survey does not suggest a majority are changing their headscarf customs specifically, but it does mark a slight reduction in women who say they wear any head cover at all. More religious government, less religious populace? Analysts say declining religious behavior in Turkey despite the government's attempts to promote it should not come as a surprise. The government's "very active and costly efforts to promote religiosity" don't appear to be having much effect, Murat Somer, a professor of political science and international relations at Istanbul's Koc University, said in an email to NPR. In general, he said, "government control and state provision of religion usually alienate people from religiosity." While the survey notes a slightly higher portion of respondents who regularly pray, those who say they fast during Ramadan dropped 12 percentage points. Somer says he has also noticed that public religious acts such as attending Friday prayers appear to be continuing steady, while more private acts such as fasting are down. He explains this as religion "becoming more publicly expressive but at the same time more shallow in Turkey." Analyst Soner Cagaptay at the Washington Institute for Near East Policy says just as modern Turkey's founder, Mustafa Kemal Ataturk, forced post-Ottoman Turkey onto a secular, pro-Western path, Erdogan has elevated Turkish and Ottoman traditions over Western values, and piety over secularism. Erdogan has said he aims to create a "pious generation" that will "work for the construction of a new civilization." That, Cagaptay says, is generating a backlash among young people. "And I think the polls are showing that because Erdogan replaced the power of authority with his own identity of this conservative, religion-loving politician, a lot of young Turks are reacting to it," he says. If these polls indicate a real trend, Cagaptay says, it could mean Erdogan's push to create a more religious Turkey is backfiring. "So I think that Erdogan maybe is ironically making Turkey less religious, when he thought that he would make it more religious with himself on top," he says. Again, that's less religious, not majority secular. "I don't hate Islam," says journalist Cebeci. But she adds, "I haven't become secular because I quit [wearing] the headscarf; I was already becoming secular while still wearing it. My reaction was toward the government policies, trying to create a new, conservative generation — that's what I was against." Cebeci believes a resistance to the push toward piety will continue to grow. She says her decision to take off her own headscarf, for instance, was a result of other women supporting her. "When women show this kind of solidarity, I think it will continue," she says. "A woman who can't find the courage to take off the scarf, if she sees this, she may find the courage to do it." Turkey has been governed for most of the last two decades by a party grounded in political Islam. So it came as a surprise when a recent poll revealed that levels of piety are flat or are even declining. It's a small shift but, as NPR's Peter Kenyon reports, it has people talking about where Turkey is headed. PETER KENYON, BYLINE: Busra Cebeci is from the Turkish generation that has known only one leader. The 25-year-old says she was a young girl in elementary school when Recep Tayyip Erdogan came to power. When we met at an Istanbul cafe, Cebeci explained that she was raised to believe proper attire for a Turkish woman includes a headscarf. And when she was a teenager, she put it on without protest. But she began to have questions. She remembers practicing for a school performance one hot May afternoon several years ago and worrying about getting overheated. BUSRA CEBECI: (Through interpreter) I remember it was really hot. So I said to my mom, maybe I should take the scarf off. And she started yelling at me. I didn't take it off. KENYON: At college, she remembers long talks with her friends about taking off their scarves. And then one day, she made a decision. CEBECI: (Through interpreter) I would look in the mirror, and I wasn't seeing myself. One day, I went inside. I took off the scarf, and I walked out without it. And that was my first day. KENYON: She says it was two years before her father would speak to her again. But eventually, her parents got used to it. Cebeci's viewpoint is reflected in a recent poll that gave respondents five categories of piety to choose from, just as they'd done in 2008. The two most devout categories, pious and religious, were down compared with 2008, while the two secular categories, non-believer and atheist, inched up a few points. The poll does not indicate Turkey's becoming secular overall. The pious and religious respondents still hold the majority. But people are asking why their numbers should be declining at all when voters keep re-electing a government proud of its roots in political Islam. Analysts say a big reason is because this government started out with a strong focus on the economy. But over time, Erdogan's use of the state to promote religion became more apparent. In this official video from 2017, he celebrates the booming growth of state-funded religious schools, which by that time were teaching some 1.3 million students. PRESIDENT RECEP TAYYIP ERDOGAN: (Through interpreter) From here, the mayors were raised. The members of Parliament were raised. The ministers and the prime ministers were raised, and even the presidents were raised. KENYON: Analyst Soner Cagaptay at the Washington Institute for Near East Policy says just as modern Turkey's founder, Mustafa Kemal Ataturk, forced post-Ottoman Turkey onto a secular, pro-Western path, Erdogan has elevated piety over secularism. That, Cagaptay said in an interview via Skype, is generating a backlash among the same young people Erdogan had hoped to mold into a pious generation. SONER CAGAPTAY: The polls are showing that because Erdogan has replaced the powerful authority with his own identity of this conservative, religion-loving politician, a lot of young Turks are reacting to it. KENYON: If these polls indicate a real trend, Cagaptay says it could mean Erdogan's push to create a more religious Turkey is backfiring. CAGAPTAY: Erdogan is, ironically, making Turkey less religious, when he thought he would make it more religious with himself on top. KENYON: Again, that's less religious, not majority secular. But Busra Cebeci, the woman who stopped wearing her headscarf, believes this is more than just a reaction to any one politician. She thinks of it as women supporting one another. CEBECI: (Through interpreter) When women show this kind of solidarity, I think it will continue. A woman who can't find the courage to take off the scarf, if she sees this, she may find the courage to do it. KENYON: She hopes it's a trend that will continue, no matter who comes to power next. Peter Kenyon, NPR News, Istanbul. Transcript provided by NPR, Copyright NPR.